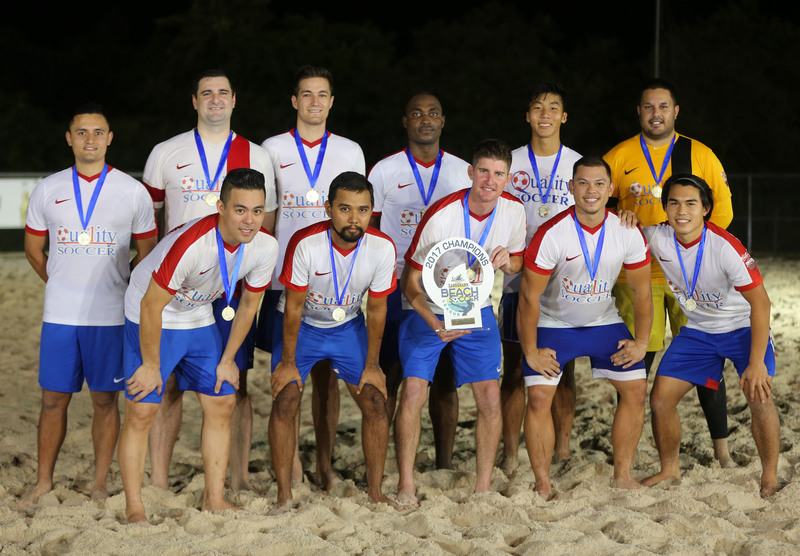 PRESS RELEASE – Quality Distributors stayed perfect in the double-elimination playoffs of the LandShark Beach Soccer League, sending off the Bank of Guam Strykers 5-2 to claim the 2017 title at the Guam Football Association National Training Center beach soccer court Saturday evening. Bank of Guam Strykers’ Mark Chargualaf accepts the league’s 2017 Golden Boot award trophy from Guam Football Association men’s administrator Samuel San Gil in an awards ceremony at the Guam Football Association National Training Center beach soccer court Saturday evening. Chargualaf scored the most goals in the league’s regular season – 16 in three matches – to win the award. Quality Distributors goalkeeper, Brett Maluwelmeng, accepts the league’s 2017 Golden Glove award trophy from Guam Football Association men’s administrator Samuel San Gil in an awards ceremony at the Guam Football Association National Training Center beach soccer court Saturday evening. Maluwelmeng, two-time winner of the award, edged Bank of Guam Strykers goalkeeper Ross Awa in the least goals allowed category during the regular season to win the award. The Bobcat Rovers finished in third place in the 2017 LandShark Beach Soccer League after the team’s loss to the Bank of Guam Strykers, 8-2, in the lower-half bracket match at the Guam Football Association National Training Center beach soccer court Saturday evening. In the photo, from left to right, are Leeray Zapatos, Rogel Estrada, Todd Pangelinan, Robby Prieto, and Brandon Auayan.